George and Harold have played a trick or two on nearly everyone at Jerome Horwitz Elementary. When their latest prank causes the school's cranky cafeteria ladies to quit, Mr. Krupp hires a trio of unusual replacements -- who happen to look an awful lot like aliens! Will that curtain-caped crusader, Captain Underpants, save the day once more? Or will those outer-space cafeteria ladies have him for lunch? 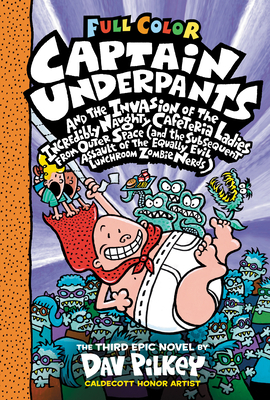 "Pilkey's sharp humor shines, and is as much fun for parents as their young readers."